Thimethylaminuria is a rare metabolic disorder that causes the defect in a certain enzyme that breaks down trimethylamine, a compound released by protein-digesting bacteria, living in our stomach. Sufferers then begin to release the compound through their sweat, urine and other bodily fluids. The result? A lingering body odor reminiscent of rotten fish, thus earning the disease its more famous nickname ‘fish odor syndrome.’ The bad news? The disease is incurable. The good news? Aside from the odor, the disease has no other visible effect on the body (not counting the psychological effect the disease inflicts upon its victims), and the odor can be controlled by a low-protein diet that limits the intake of choline, an amino acid that can cause the odor to arise (although there has been cases where this didn’t have an effect on the symptom). 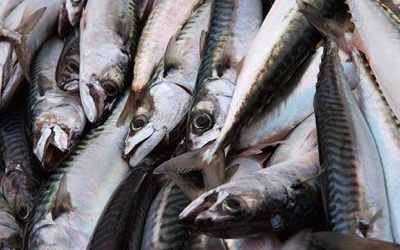 Interesting Fact: In the William Shakespeare play ‘The Tempest,’ one of its characters, Caliban, the socially rejected island dweller, exhibited symptoms of fish-odor syndrome, as evidenced by the following lines: “What have we here? A man or a fish? Dead or alive? He smells like a fish; a very ancient and fish-like smell …” which may suggest that the disorder was known at that time. In reality, the first recorded case of trimethylaminuria in medical literature happened in the 1970’s. Jeanna Giese, of Fon du Lac, Wisconsin, defied medical odds by being the first person to survive rabies without a vaccination in 2004. The, then-15-year-old girl, got infected with the virus when she got bitten by a bat, but since the wound she sustained was shallow, she didn’t seek medical attention until thirty-seven days later, when the virus began attacking her body. The disease then progressed so fast that by the time she was admitted and diagnosed at the Children’s Hospital of Wisconsin in Milwaukee, she was in a near-state coma. But instead of giving up, Rodney Willoughby, an infectious disease specialist in the hospital, decided to try a novel treatment on Giese to save her life. The treatment involved giving her a cocktail of drugs that would induce a coma, to preserve her brain from the virus. This was to give Giese’s immune system time to fight the deadly disease, while giving her a chance to survive. The risky treatment worked, however, and thirty-one days later, she was declared rabies-free. Although the treatment left Giese with some brain damage, the girl responded to rehabilitation therapy and recovered quickly, much to the surprise of her doctors. Interesting Fact: The experimental treatment that was used to cure Giese, dubbed the Milwaukee Protocol, is now currently under trial, and so far two patients out of twenty-five were cured. However, there had been some controversies regarding Giese’s survival under the treatment, one of which is that Giese was infected with a weaker form of rabies, and that significantly affected her response to the treatment. Interesting Fact: In an effort to diagnose her mystery condition, Velasquez has joined a genetic study run by Professor Abhimanyu Garg of the University of Texas. Garg suspects Velasquez may have a form of neonatal progeroid syndrome, which causes “accelerated aging, fat loss from the face and body, and tissue degeneration.” For more information, visit Lizzie’s site. A 14-month old boy from Hunan, China, was born with a transverse facial cleft crossing his face from ear to ear, dividing his face into two parts, giving him the illusion that he’s wearing a mask. The cause for the defect of the baby (named Kangkang) is still undetermined, but an infection might be the culprit. Although the treatment to correct the cleft is terribly expensive, Kangkang’s family were, fortunately, able to come up with the 300-400,000 yen needed for the surgery. Pictured above is a much milder form of the same illness. 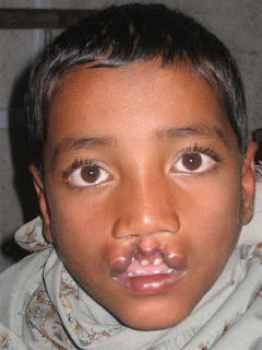 Interesting Fact: Facial clefts are, comparatively, rarer that cleft lips and palates, but they have similar origins: they are caused by the incomplete fusing of the facial bones of babies during conception. Hannah Kersey of Northam, Devon, England, was born with uterus didelphys, a malformation of the reproductive organs that resulted in her having two wombs. 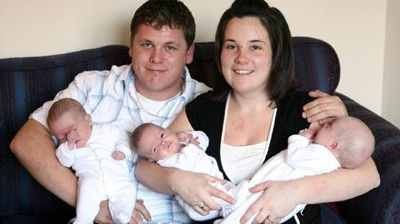 In December 2006, Kersey defied odds of 25 million to one by giving birth to three healthy girls from her two wombs. Identical twins Ruby and Tilly were delivered from one womb, while Grace was delivered from the other. While simultaneous gestation of the two wombs in women with uterus didelphys can happen (70 cases were recorded), Kersey’s triplet birth was a medical first. Interesting Fact: Women with uterus didelphys are often asymptomatic, meaning they aren’t aware of their condition until they are medically examined. In pregnancies of women with this condition, premature birth is quite common. In Kersey’s case, the triplets arrived seven weeks prematurely. Ncise Cwayita, from South Africa, gave birth to a healthy 2.8 kilogram baby girl, despite the fact that she developed, not in her mother’s womb, but in her liver. The strange pregnancy was thought to be caused by the embryo falling out of the fallopian tube and attaching itself to her liver (this is called extrauterine pregnancy). Since the liver is a rich source of food for the embryo, it continued to gestate as normal, as it is protected by the placenta. Although babies developed out of the uterus often die within a few weeks, the baby girl, named Nhlahla (‘luck’ in Zulu) appears to be perfectly healthy. Interesting Fact: There have been only fourteen documented cases of babies conceived in their mother’s liver. Of these cases, only four survived the pregnancy (including Nhlahla). 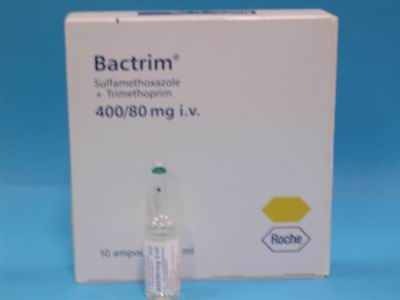 After taking a ten-day course of Bactrim, a very common antibiotic, to treat a sinus infection, Sarah Yeargain, from San Diego, California, was shocked when her skin suddenly started sloughing off her body. ‘I started to get some minor swelling and discoloration in my face and it progressed into blistering on lips and swelling on my eyes. It then progressed into blisters all over my face and chest and arms,’ Yeargain said. Two days later, at the San Diego Regional Burn Center at the University of California, she lost the skin on her entire body, including her internal organs and the membranes on her eyes, mouth and throat. Doctors gave her a slim chance of survival, but after covering her entire body with transcyte, an artificial skin replacement, and some medications to control the internal bleeding, Yeargain miraculously recovered. Within a week later, her skin grew back. It is thought that the cause of Yeargain’s dramatic skin loss is toxic epidermal necrolysis, which basically is a severe allergic reaction to the antibiotic she took. Interesting Fact: Fans of the TV series ‘House, M.D.’ might recall the second-to-the-last episode of Season 5 (entitled ‘Under My Skin’), where a patient exhibited toxic epidermal necrolysis while under House and his medical team’s care. 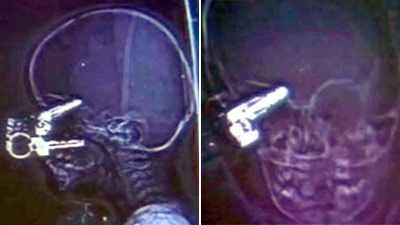 In September 2008, 17-month old Nicholas Holderman, from Kentucky, made an astonishingly fast recovery after a freak accident where the toddler had a set of car keys impaled to his brain. The toddler was playing with his two older brothers when he somehow fell upon the keys. One of the keys pierced his eyelid and made it all the way to his brain. The parents Staci and Chris, alerted by his scream, went immediately to see what happened and were shocked by what they saw. The mother immediately called 911, and Nicholas was helicoptered to a medical unit. The medical team managed to remove the key successfully, without damage to the brain, and although the eye was ruptured, Nicholas’s eyesight was completely unaffected. Interesting Fact: A quite similar but less severe incident occurred at a restaurant in Minnesota on July 2007, where an unnamed boy accidentally fell upon the fork he was holding. Fortunately, the fork only went through and out of his nose, and it was successfully removed with little damage to his face. On July 12, 2002, 18-year old Marcos Parra was involved in a car accident that left his skull literally separated from his cervical spine, in a condition called internal decapitation. Only the ligaments on his neck were connecting his head with his body, but his spinal cord and arteries were intact. 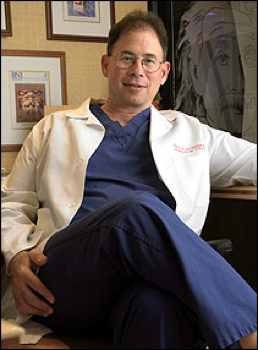 However, a medical team led by Dr. Curtis Dickman (pictured above), a neurosurgeon at the St. Joseph’s Hospital in Phoenix, Arizona, saved his life by performing a radical, groundbreaking operation wherein two surgical screws were used to fasten Parra’s head to his spine. Amazingly, the risky operation worked, and Parra fully recovered. Since then, Dickman’s team has successfully performed the same surgery on two other patients. Interesting Fact: There is a similar story to this. Ricky Barker was also internally decapitated after a 2004 accident where the bike he was riding collided with a car. Three months later however, Barker walked out of the hospital with only a paralyzed left arm, a limp and a hole in his throat (so that he could breathe) to remind him of the accident that almost took his life. Interesting Fact: When specialists began decoding Brooke’s DNA sequence, they found out that certain genes associated with DNA repair were normal. Mutated copies of those genes are thought to be responsible for ‘rapid aging’ disorders like progeria and Werner syndrome.